The Amsterdam Halls (‘De Hallen”) is a complex of monumental buildings in Amsterdam West. The complex was built in the early 1900s to house a tram depot and maintenance garage. Since 2015, after big renovations, the Amsterdam Halls is now one of Amsterdam’s most popular cultural venues. There is a cinema, a food court, a restaurant, a hotel, television studios, a library, an art gallery and a number of boutiques, craft shops and small businesses. In the weekend, the passage is often used as a market for locally produced goods and food. The Halls are roofed, so it’s great to spend time here when it is raining in Amsterdam. The halls centre around the Dankbaar Passage, an indoor corridor that opens to the cinema and the food court. In the passage you can visit many shops. In weekends there is often a market for creative craft and design from Amsterdam. Check the Amsterdam calendar of events for dates for markets and special events. The Amsterdam Halls is a monumental building. From the main Kinkerstreet, the long stretched halls are hidden from view. You can enter from the daily market Ten Kate Markt and from the Tollensestreet. This area of Amsterdam is called Amsterdam Old-West, once a workers neighbourhood. The workers repaired the first electric trams of the city. Since 1999, the Amsterdam Halls are an official national monument of The Netherlands. After a lot of debate, fuss and financial planning, it was decided to give the building back to community and construction of the cultural venue started. It opened in fases from 2014. The architecture of De Hallen is spacious, with its industrial history kept visible. The huge iron construction spans as a roof and gives the building a sky light. The Halls open via grand old wooden doors, set in typically Dutch red brick facade. The Amsterdam food court at de Food Hallen are Amsterdam’s only city centre food court. You can enjoy delicacies from around the world here: ham from Spain, Chinese Dim Sum, German hotdogs, Indian, Mexican and many more. Try some Dutch food at the Amsterdam Food court Halls. From Amsterdam are the bitterballs at the Ballenbar from Michelin star chef Peter Gast and his former sous-chef Jeroen Elijzen. At the mobile version of restaurant l’Entrecôte et les Dames (at Van Baerlestraat) you can try their entrecote steak. The hip Amsterdam burger bar The Butcher has burgers. Sweet teeth must try a miniature tart from Dutch-French Petit gâteau. For a quiet coffee, hop into the café of Belcampo. Belcampo is part of the Amsterdam public library, so there is enough food for thought. Plug in your laptop and write some mails while you sip your affordable coffee. Find the Kanarie Club at the Bellamy Square (or walk through the Food Court). There is an international feel to this light bar. In summer, there is a big sunny terrace outside and even a swimming pool upstairs! The Kanarie Club at the Amsterdam Hallen. Hotel De Hallen is a hip design hotel located in the Amsterdam Halls. There are all kinds of quirky design features here with lots of plants and art. The outside terrace is also nice and they have their own bistro restaurant. Along the main corridor of the Amsterdam Halls, there are a number of shops that make a visit to the Amsterdam Halls worth your while if you are not interested in food or films. Honourering the many workers that spent here working with their hands, the Amsterdam Halls focuses on craft and design shops, like Art Deco shop, where you can find original gifts from the 1920’s. The owner uses original fabrics for furniture that come straight from the roaring twenties and refurnishes furniture for hotels and cafés like Café Schiller and cinema Tuschinsky. Grand &Johnson show off their interior design in their own shop. Recycle is a modern bike shop that specializes in restoring and selling old, classic bikes. They offer people with a psychiatric background find their way back into society by working in the shop. Keep losing your socks? Get a pair at Qnoop. You can tie the pair together so your socks will never be lonely again. Get your stuff tattoed at Uncover Lab. Get your portrait taken at photo studio Hester, find your ‘Holy Oil‘, and shop for ladies fashion at La Salle fashion. The Gathershop and The Maker Store are great to spend time to snoop around all those beautiful and intelligent designed stuff you never knew you wanted. Check out the Amsterdam event calender because every 2 weeks there is a maker market where you can buy design an fashion from Amsterdam makers. 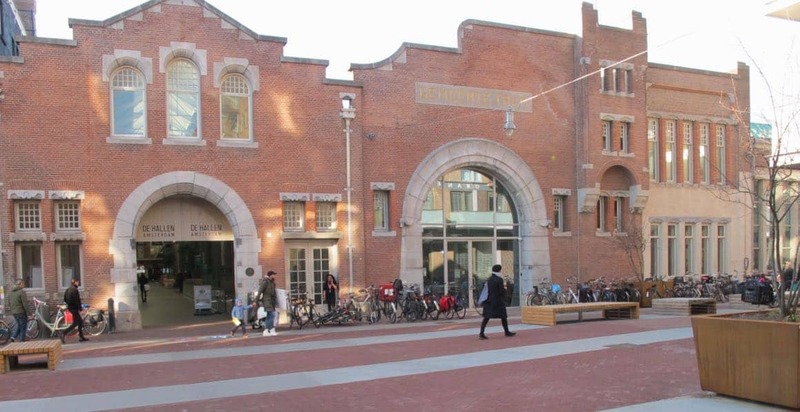 Amsterdam West also obtained a much needed art film house with the renovating of this old industrial depot. At de Film Hallen movie theatre, films are screened every day, from quality films from Hollywood to art house films and documentaries. More Amsterdam art film houses. Fiilmhallen, cinema at De Hallen. The Amsterdam Halls are easily reachable. From Leidsplein it’s a 20 minute walk. Just enter the Kinkerstraat from the Marnixstraat and keep walking. You can enter the Halls from the Kinkerstraat via the Bilderdijkkade (along the water), the Tollensestraat or via the daily Ten Kate food market. Other popular places are Anne&Max coffee bar and The Breakfast Club (North side).